I have an ability to put an insane amount of pressure on myself to get this right quickly. I want to learn a LOT… I want to learn it quick… and master it first time round. If not… I get bored. This week… I have been struck by the fact that I need to take each moment… and really enjoy it… Enjoy the time I have! I guess that my birthday was the initial trigger, but the main realisation came through an innocent, somewhat everyday experience in my back garden. 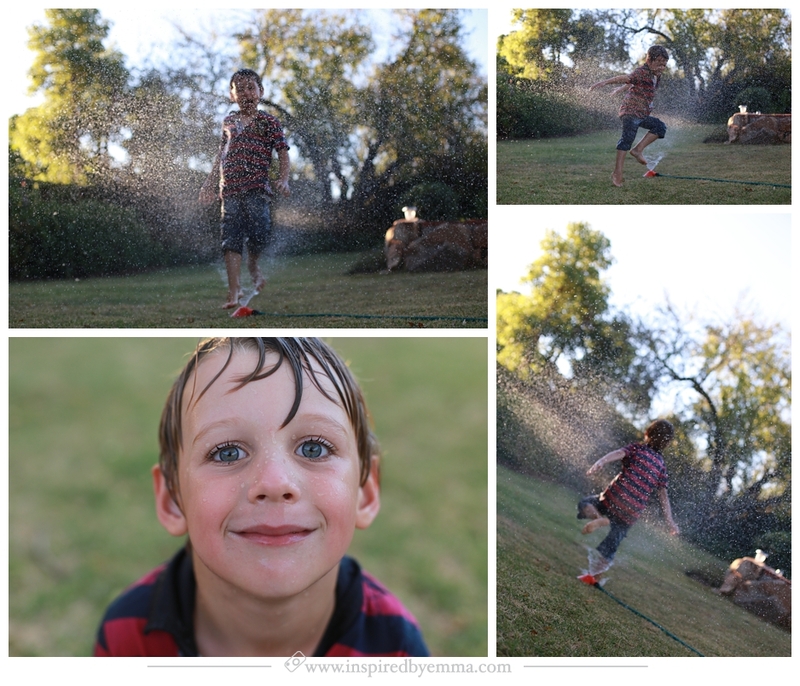 I was busy working – and my nunu wanted the sprinkler set up in the garden. After watching him for a bit, I was itching to capture him… His Joy and sheer abandon! Whilst my son was happily playing, I allowed myself to do the same from behind the lens. But through this experience [and numerous crappy images] I had something profound happen. in order to perfect what I do… I need to encourage myself to try things that stretch me beyond my comfort zone. beyond the “safe” images that I am mastering… and allow myself the mistakes, and in return – I gain the growth. Granted… I wasn’t trying this on a client shoot… but the good news – is that when I am on a client shoot and something happens to my focus… I’ll know how to work around the situation…because I played! Let Go… it doesn’t have to be right the first time. Be in the moment, and look for opportunities to try – everywhere! … and be inspired to grow. I’d love to know how you grew from taking the time… and letting go [and I’m sure that the others would too] – so share your moment in the comments below. Great article, we spend so much time doing stuff and not playing, that the creativity and impulsiveness often is not present in our lives. Thanks for the gentle kick as a reminder Emma.